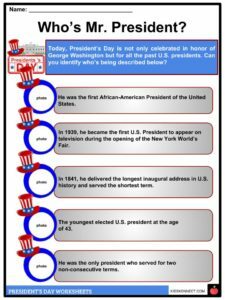 President’s Day, previously known as Washington’s Day, and also known as Presidents’ Day, is a national federal holiday celebrated every third Monday of February in the United States. 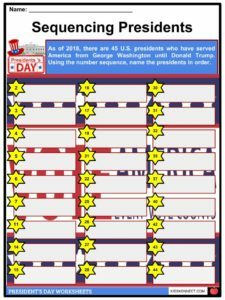 President’s Day, previously known as Washington’s Day, is a national federal holiday celebrated every third Monday of February in the United States. 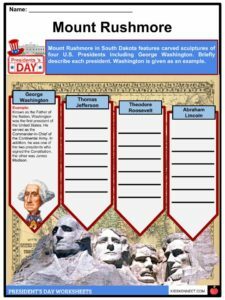 It is meant to celebrate George Washington’s birthday and pay tribute to all U.S. presidents. At the same time, some states commemorate the birth of Abraham Lincoln. 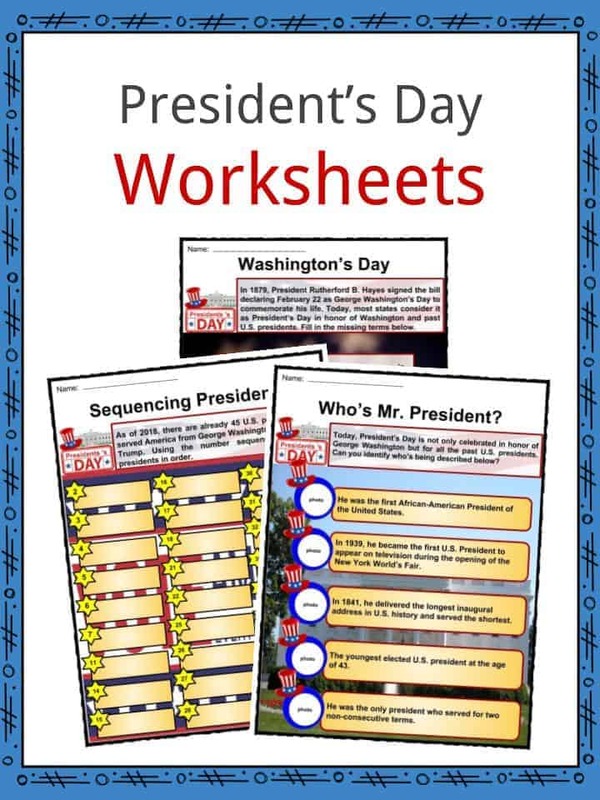 See the fact file below for more information on the President’s Day or alternatively, you can download our 25-page President’s Day worksheet pack to utilise within the classroom or home environment. George Washington was born on February 22, 1732, in Westmoreland County, Virginia. In 1775, he was appointed as the Commander-in-Chief of the Continental Army through the Second Continental Congress held in Philadelphia. In 1789, Washington became the first and only president of the United States who was elected unanimously by the Electoral College. He served for two terms from 1789 to 1797. During the late 1870’s, Arkansas Senator Steven Wallace Dorsey proposed that Washington’s birthday should be a federal holiday. In 1879, President Rutherford B. Hayes signed the bill declaring February 22 as George Washington’s Day. Many believed that Washington was one of the most important politicians in American history. He became the first U.S. citizen to have a holiday in his name. On June 28, 1968, the Uniform Monday Holiday Act was signed into law. It was meant to give federal employees three-day weekends to increase the travel industry. It included Monday holidays such as Washington’s Day (3rd Monday in February), Memorial Day (last Monday in May), Labor Day (1st Monday in September), Columbus Day (2nd Monday in October), and Veterans Day (4th Monday in October). 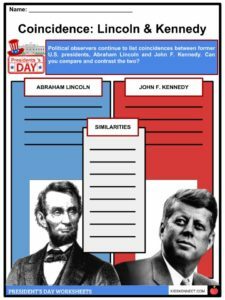 The Act did not directly established the celebration of Abraham Lincoln’s birthday (February 12) but some states combined the celebration with Washington’s Day. By 1971, Washington’s Day was moved to the 3rd Monday in February. 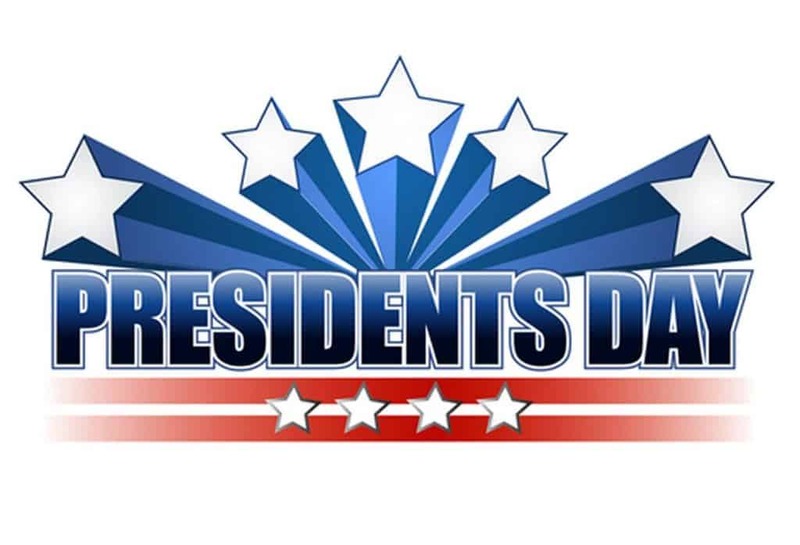 Today, most states call the holiday President’s Day, commemorating George Washington while some honor past presidents of the United States – Presidents’ Day. 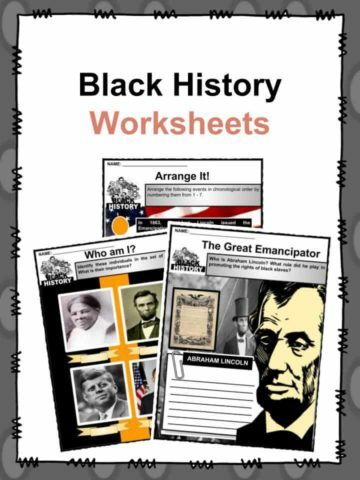 Schools organize activities, events, and lessons in relation to the life of U.S. presidents, specifically George Washington and Abraham Lincoln. In terms of business, retailers use this time to sell old stock. In Indiana, observance of Washington’s Day was moved to December since the original commemoration falls during mid-winter recess. There were four U.S. presidents born in February, namely George Washington (February 22), Abraham Lincoln (February 12), Ronald Reagan (February 6), and William Henry Harrison (February 9). The White House in Washington D.C. is the official residence of the sitting United States president. It was designed by James Hoban in the 1790s. It was then called the President’s House until it was established as the White House by President Theodore Roosevelt. On November 1, 1800, President John Adams and First Lady Abigail Adams became its first residents but it was Thomas Jefferson who held his first inauguration in Washington, D.C.
On July 4, 1826, during the 50th Anniversary of the Declaration of Independence, former presidents Thomas Jefferson (3rd) and John Adams (2nd) died. In addition, James Monroe (5th) also died on the 4th of July in 1831. By contrast, Calvin Coolidge (30th) was the only president born on the 4th of July, 1872. Mount Rushmore in South Dakota features the gigantic carved sculptures of Presidents George Washington, Thomas Jefferson, Theodore Roosevelt, and Abraham Lincoln. Sculptor Gutzon Borglum started the work in 1921 and finished in 1941. The “Shrine of Democracy” has become one of the most famous attractions in the U.S. In 1881, James Garfield (20th) was the first president to talk on the telephone. In a distance of 13 miles, he spoke to inventor Alexander Graham Bell. In 1939, Franklin Roosevelt (32nd) became the first president to appear on television. Grover Cleveland was the only president be elected in two non-consecutive terms. He became the 22nd and 24th president of the United States with Benjamin Harrison as the 23rd. There were six presidents named James: Madison (4th), Monroe (5th), Polk (11th), Buchanan (15th), Garfield (20th), and Carter (39th). A number of U.S. presidents served in the military, including Washington, Jackson (7th), and Taylor (12th). Only Dwight Eisenhower served both in WWI and WWII. Richard Nixon (37th) was the first president to visit all 50 states and the only one to resign. James Buchanan (15th), the only bachelor president, secretly bought slaves in Washington D.C. and set them free in Pennsylvania. It was George Washington who delivered the shortest inauguration speech in American presidential history with 135 words. By contrast, William Henry Harrison’s 1841 inaugural address was the longest yet he served the shortest with 30 days in office. At the age of 42, Theodore Roosevelt became the youngest president after the assassination of William McKinley (25th). John F. Kennedy was the youngest elected U.S. president at the age of 43. There were nine presidents who did not attend college, including Washington, Jackson, Van Buren, Taylor, Fillmore, Lincoln, A. Johnson, Cleveland, and Truman. 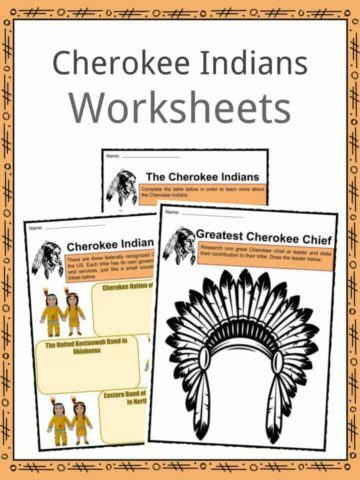 Lincoln was the first president to be born outside the original thirteen colonies. In 1978, Jimmy Carter became the first president from the South. Out of 45 U.S. Presidents, four of them were assassinated. First, Lincoln was shot at Ford’s Theater on April 14, 1865, by John Wilkes Booth. Second, 200 days after he took his oath of office, James Garfield was shot twice by Charles Guiteau on July 2, 1881. Inventor Alexander Graham Bell even tried to cure Garfield by inventing a metal detector. On September 6, 1901, barely a year into his second term, William McKinley was shot at the Temple of Music in Buffalo, New York. With coincidental similarities to Lincoln, J.F.K. was shot by Lee Harvey Oswald during his motorcade in Dallas, Texas. Both Lincoln and Kennedy were shot in the head on a Friday in the presence of their wives. Their assassins were killed before facing any trial. 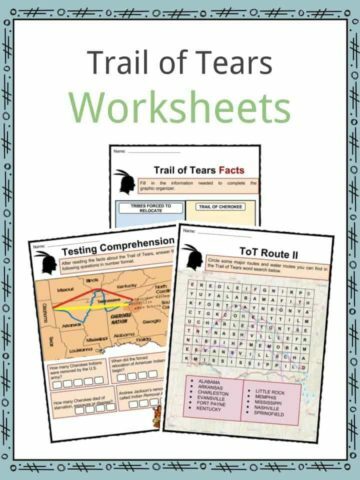 They defeated incumbent vice presidents when Lincoln was elected in 1860 and J.F.K. in 1960. After their deaths, both successors were Southern Democrats named Johnson (Andrew and Lyndon). William Henry Harrison (9th) and Benjamin Harrison (23rd) were the only grandfather-grandson tandem who became presidents. Furthermore, John Adams (2nd) and John Quincy (6th) and George H. W. Bush (41st) and George W. Bush (43rd) have been the two sets of father-son presidents. In 2009, Barack Obama was elected as the first African-American President of the United States. He served for two consecutive terms from 2009 until 2017. As of 2010, there were 23 U.S. Presidents who appeared on U.S. coins and paper bills. According to the law, only the portraits of a deceased individual may appear on U.S. currency. There have only been six non-presidents that have appeared on U.S. currency including Benjamin Franklin (founding father), Alexander Hamilton (first U.S. Secretary of Treasury), Salmon Chase (Secretary of Treasury), John Marshall (U.S. Supreme Court Justice), Susan B. Anthony (American suffragist), and Sacagawea (Shoshone interpreter of the Lewis and Clark expedition). This is a fantastic bundle which includes everything you need to know about President’s Day across 25 in-depth pages. 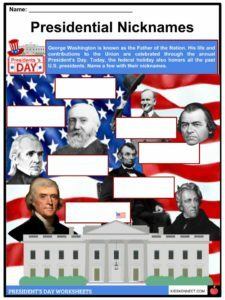 These are ready-to-use President’s Day worksheets that are perfect for teaching students about the President’s Day, previously known as Washington’s Day, which is a national federal holiday celebrated every third Monday of February in the United States. 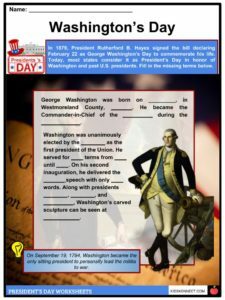 It is meant to celebrate George Washington’s birthday and pay tribute to all U.S. presidents. At the same time, some states commemorate the birth of Abraham Lincoln.